Plenty of attention was given to our institute stall at POWTECH 2019, featuring the famous popcorn fluidized bed. We presented our research and capabilities to a wide audience of key industry players and performed thorough networking. 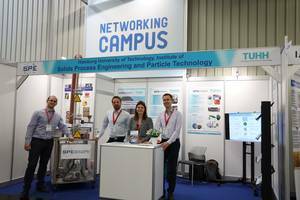 We congratulate our dear colleague Sophia Rothberg for placing third at the "PARTEC-Powder Technology Poster Award" at the PARTEC 2019 conference, hosted at the Nuremberg Messe. 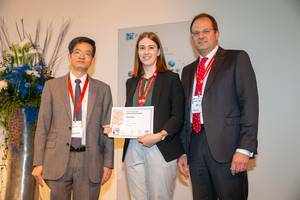 Her poster was titled "Fabrication of highly-filled composites using spouted bed spray coating" and the underlying work was performed in cooperation with Prof. Schneider of TUHH and Prof. Abetz at the University of Hamburg. Dr.-Ing. 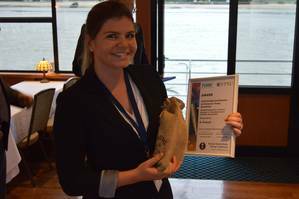 Swantje Pietsch wins "Best Presentation Award"
We congratulate our dear colleague Dr.-Ing. 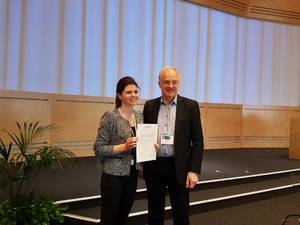 Swantje Pietsch for winning the "Best Presentation Award" at the ProcessNet Fachgruppentreffen "Agglomeration und Schüttguttechnik" 2019, hosted at and by the Nestlé Research Center in Lausanne. Her talk was titled with "In-line monitoring of coating quality and quantity in a three-dimensional prismatic spouted bed" and the work was performed in cooperation with the Process Engineering and Particle Technology & Pharmaceutical Engineering Research Center in Graz. on the 12th of December 15:00 in our seminary room (K2511). Particle and powder processing plays an essential role in a wide range of industries, spanning foods, pharmaceuticals, consumer products, additive manufacturing, specialty chemicals, minerals processing, and many more. Despite the importance of powders in manufacturing, many of the unit operations remain difficult to design and predict, and require extensive experimentation and trial and error for scale up. It is clear that better fundamental understanding is required. My research focuses on understanding particle-particle and particle-fluid interactions, using these interactions to develop mechanistic understanding of powder processes, and identifying and quantifying the rate processes that are occurring. In this talk, I will discuss some of my research on the rate processes of three different methods of powder processing: powder coating, granulation, and spherical agglomeration. 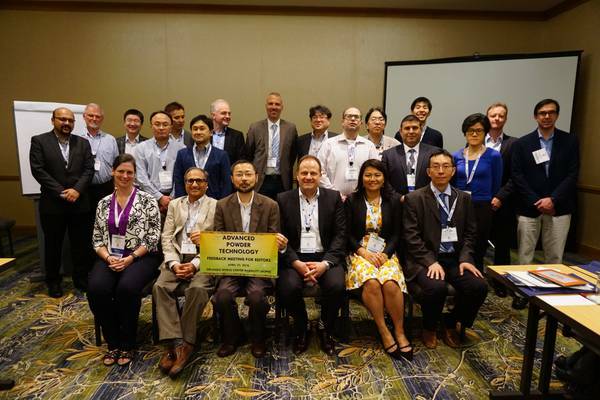 The editorial board of Advanced Particle Technology met at the 8th World Congress on Particle Technology in Orlando to discuss future developments and upcoming issues. As a long-time editor, Prof. Stefan Heinrich participated. "... to meet the demand for an international journal that integrates all aspects of science and technology research on powder and particulate materials. " "Advanced modelling and control of continuous pharmaceutical manufacturing process"
on the 16.07.2018, 14:00 in Room N009. Currently, pharmaceutical industries are going under paradigm shift from traditional batch to novel continuous manufacturing. Such a novel continuous plant has been built at C-SOPS which is being adapted by several pharmaceutical companies. In this work, the continuous pharmaceutical manufacturing (CPM) pilot-plant has been further modernized via utilizing process system engineering methods and tools. Process model, real time monitoring, advanced model predictive control (MPC) system, data management system and material tracing system are critical components of modernized CPM pilot-plant. A validated process model has been developed for in-silico studies and virtual experimentations. A process model plays a very important role to design, evaluate and tune the control system. The developed control system has been then implemented in to the continuous tablet manufacturing pilot-plant for practical demonstration. Moreover, a RTD (residence time distribution) based control system has been developed for automatic real time rejection of tablets which are not complying with regulatory expectations on drug concertation. The Center for Biobased Solution (CBBS) has launched - with SPE as a founding member. The challenges that our society is facing are enormous including climate change, growing population, limited resources, decline of crude oil, energy supply, nutrition, health and mobility. The development of intelligent bioeconomy concepts will play a pivotal role for the future developments, which are based on the more efficient use of the biomass of our planet aiming at the production of new biobased materials, pharmaceuticals, biopolymers and chemicals for various applications. Digitalization will have a great impact on this transformation process as well as advanced training and qualification programmes. The successful transition from crude oil era to bioconomy will be dependent on the efficient conversion of biomass by reliable and stable catalytic processes. Specific adapted technologies of mechanical, chemical and biotechnological nature are needed and interdisciplinary connected. In addition, other disciplines including metagenomics, transcriptomics, logistics and social aspects are essential. on the 19.06.2018, 13:00 in Building K, room 2511. The head of our institute, Prof. Dr.-Ing. 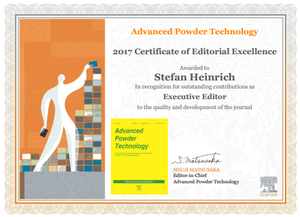 Dr. h.c. Stefan Heinrich, was honored by the editorial board of "Advanced Powder Technology" for his contributions to quality and development of the journal. "Advanced Powder Technology" aims to integrate all aspects of science and technology research on powder and particulate materials. 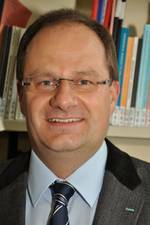 Prof. Stefan Heinrich serves the journal in the capacity of executive editor. A cooperation of our institute with researchers of the Institute for Optical and Electronic Materials, ITMO University of Saint Petersburg and the Helmholtz-Zentrum Geesthacht developed a concept for nontoxic, nonbleaching and temperature-resistent pigments. So called photonic glasses feature a disordered arrangement of particles. The researchers were able to precisely tailor the spectral features by combining well-chosen particle geometries with short range ordering. halten. Die genauen Uhrzeiten und der Veranstaltungsort werden noch bekannt gegeben. Interessierte Studierende sollen sich bitte über StudIP in die Veranstaltung eintragen. 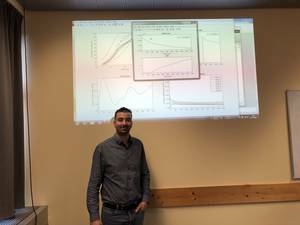 Prof. Dr. Stefan Pirker, Head of the Department of Particulate Flow Modelling from the Johannes Kepler-Universität Linz (JKU) will visit our institute on April 3 & 4 2018. His research interests are numerical modelling of particulate flows with special emphasis on multi-scale model synthesis. This involves (i) embedded co-simulations and sub-grid models, (ii) hybrid Eulerian and Lagrangian simulations as well as (iii) recurrence models for efficient time extrapolation of full CFD simulations. The outcome of his research group has been disseminated by open-source codes (CFDEMcoupling, LIGGGHTS) and by to date more than 150 publications in scientific journals and refereed conference proceedings. He will give a lecture titled "Can we bridge between recurrence CFD (rCFD) and process control?" on April 3rd 14:00 in Room H0.09. In applying rCFD to a set of single-phase and multiphase flows, we experienced a computational speed-up of two (flow based rCFD) to four (transport based rCFD) orders of magnitude. In many cases this dramatic speed-up allows for faster-than- realtime simulations, although we didn’t reduce the resolution of the original full CFD simulation. on Thursday, 27.03.2018 at 14:00 in room O0.07 (building O). This seminar will focus the use of advanced mathematical models (e.g. PBM, DEM) in combination with state of the art cyberinfrastructure to quantify and validate the dynamics of continuous drug product manufacturing processes such as wet granulation and milling. The seminar will also focus on the development of novel PAT and control methodologies to optimize such processes. 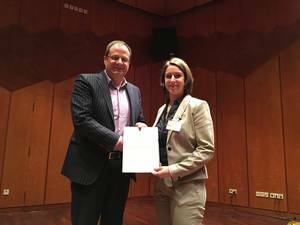 Doctoral Student wins "Best Poster Award"
We congratulate our dear colleague Jana Kammerhofer for winning the "Best Poster Award" at the ProcessNet Fachgruppentreffen "Agglomeration und Schüttguttechnik" 2018. The literally award-winning poster presents her latest research into the wetting behavior of food powders. MINT mit Spaß vermittelt und somit früh das Interesse an Technik und Naturwissenschaften wecken und fördern - das ist seit jeher das Ziel der Kinderforscher an der Technischen Universität Hamburg (TUHH). Nach dem großen Jubiläum im vergangenen Jahr geht in diesen Tagen der elfte Kurs "Experimentieren und Forscher“ zu Ende. Aus diesem Anlass laden die Kinderforscher zur bunten öffentlichen Abschlussfeier am 17. Januar mit Präsentationen aus dem Nachwuchsprogramm sowie spannenden Show- und Mitmachexperimenten. Kaum eine Berufsgruppe ist hierzulande so gefragt wie Ingenieure, Informatiker, Naturwissenschaftler & Co. „In diesem praxisorientierten Projekt wecken Experimente in den Schulen zunächst die Neugier, bevor die Kinder hautnah miterleben, wie an der TUHH an den gleichen Themen geforscht wird", erklärt Gesine Liese, Leiterin des Projekts Kinderforscher an der TUHH, das Konzept von "Experimentieren und Forscher“. 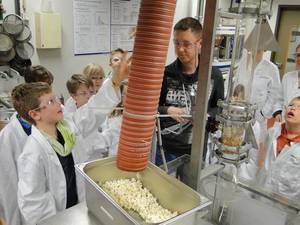 So lernten etwa Dritt- und Viertklässler der Schule „In der Alten Forst“ kürzlich, was Popcorn mit Partikeltechnologie zu tun hat. Dabei staunten sie nicht schlecht, als sie eine von TUHH-Studenten gebaute Maschine in Aktion sahen, die veranschaulichte, was heiße Luft mit Maiskörner macht. Nun wissen die Nachwuchsforscher: Durch heiße Luftströmung verdampft das im getrockneten Maiskorn enthaltene Wasser, das sich hierbei ausdehnt und aufplatzt. Dadurch werden die Maiskornpartikel deutlich größer und haben gleichzeitig eine geringere Dichte als die verschlossenen Körner. Insgesamt haben am aktuellen Kurs rund 150 Dritt- und Viertklässler aus drei Bundesländern teilgenommen. Ermöglicht wird dies durch die Unterstützung der Beratungsstelle Besondere Begabungen am Landesinstitut für Lehrerbildung und Schulentwicklung Hamburg sowie der Firma MERCK. 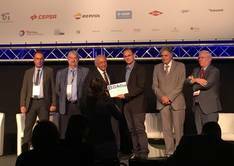 Professor Stefan Heinrich, head of the Institute of Solids Process Engineering and Particle Technology at TUHH, was elected chairman of the „European Working Party on Agglomeration“. 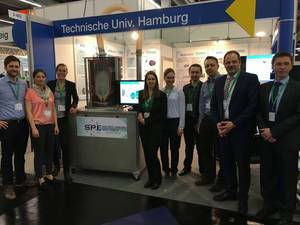 This is one of 20 working parties in different fields of the European Federation of Chemical Engineering (EFCE). 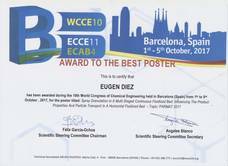 Im Rahmen des World Congress of Chemical Engineering WCCE10, der Welttagung der Verfahrenstechnik, ist der Doktorand Eugen Diez der Technischen Universität Hamburg (TUHH) mit dem Best Post Award geehrt worden. Mit seinem Beitrag „Spray granulation in a multi-staged continuous fluidized bed: Influencing the product properties and particle transport in a horizontal fluidized bed“ wurde seine Arbeit aus insgesamt 62 Poster-Beiträgen ausgewählt. Das ausgezeichnete Projekt wird am TUHH-Institut für Feststoffverfahrenstechnik und Partikeltechnologie von Prof. Heinrich betreut. Wie wird Waschpulver so fein körnig? Wie können Arzneimittel den Wirkstoff noch gezielter freisetzen? Warum funktioniert die Babywindel so gut? Warum verklebt Lebensmittelpulver nicht? Wie kann man den Einsatz von Dünge- und Pflanzenschutzmitteln drastisch reduzieren? Im Projekt wird der Fragestellung nachgegangen wie hochwertige, frei fließende und staubarme körnige Feststoffe mit verbesserten Gebrauchseigenschaften energie- und umweltschonend hergestellt werden können, die im täglichen Leben oder in zahlreichen Industrien Anwendung finden. Zur Lösung dieser Aufgabe wird ein skalenübergreifender Ansatz verfolgt, der experimentelle Untersuchungen mit unterschiedlichen Modellierungsansätzen und einer systemdynamischen Analyse einer kontinuierlichen Wirbelschicht-Sprühgranulation kombiniert. Die prämierte Arbeit entstand innerhalb des DFG-Schwerpunktprogrammes 1679 im Rahmen gemeinsamer Forschungen mit dem Lehrstuhl für Thermische Verfahrenstechnik (Prof. Tsotsas) sowie dem Lehrstuhl für Automatisierungstechnik / Modellbildung (Prof. Kienle) der Universität Magdeburg. 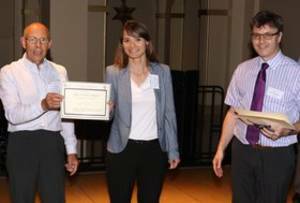 At this years' 8th International Granulation Workshop in Sheffield, UK, from 28th - 30th of June, two researchers from our Institute received poster awards. 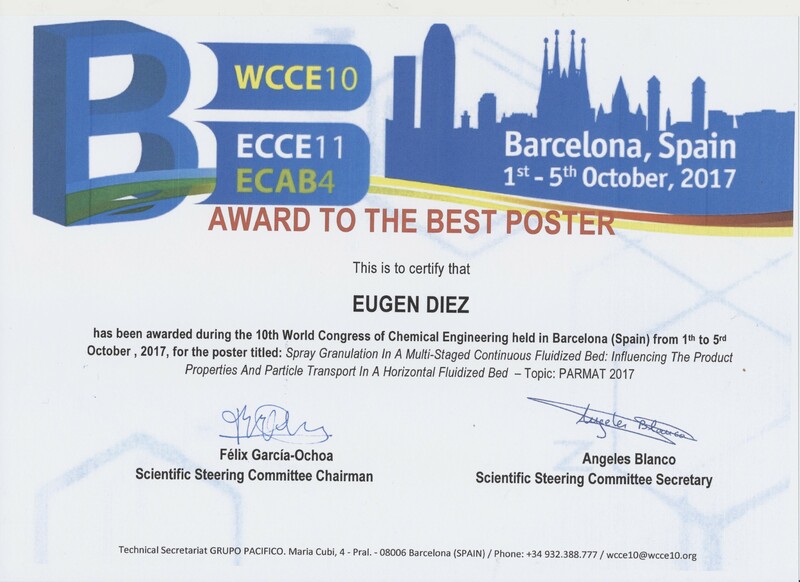 From over 120 posters Eduard Eichner was awarded with 1st Best Poster Award for Innovative Application of the Chemical Sciences to Granulation Technology for his poster about Fabrication of copper-polymer composites using the spouted bed granulation process. 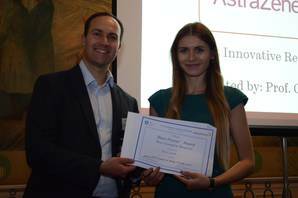 Monika Goslinska received 3rd Best Poster Award for Most Innovative Research for her contribution: Usage of spouted bed technology to coat aerogel particles. The International Granulation Workshop, which takes place every two years, is the largest conference in the field of granulation, agglomeration, coating and encapsulation of particulates in the pharmaceutical, chemical, ceramics, biotechnology and food industries. We congratulate Eduard and Monika for their achievements. We congratulate her for her achievements in this field. Britta Buck (SPE) erhält Preis für besten Vortrag auf ProcessNet Jahrestreffen "Agglomerations- und Schüttguttechnik"
Frau Britta Buck, Doktorandin des Instituts für Feststoffverfahrenstechnik und Partikeltechnologie (Leiter: Prof. Heinrich), hat auf dem Jahrestreffen der ProcessNet Fachgruppe "Agglomerations- und Schüttguttechnik“, das vom 13.02.-14.02. in Bruchsal stattfand, mit dem Beitrag „Comparison of experimental and numerical investigation of wet particle-wall collisions“ den Preis für den besten Vortrag erhalten. Die Auszeichnung fand auch Anklang in der Presse. Die Fachgruppe "Agglomerations- und Schüttguttechnik“ hat sich die Erforschung sowohl der physikalisch-chemischen Grundlagen der Agglomerationstechnik, der Produktgestaltung und -formulierung, des Lagerns, Förderns und Dosierens von dispersen Feststoffen (Schüttgüter, feine Pulver) als auch deren praktische Anwendungen in den Anlagen der stoffwandelnden Industrie zum Ziel gesetzt. Researchers from his institute will hold a total of 6 oral presentations. 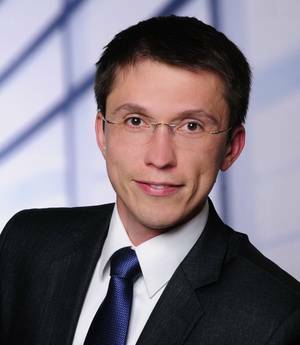 At his years conference PARTEC 2016 Prof. Stefan Heinrich was elected as new Chairman to organize next PARTEC conference in Nuremberg. See for more information. Alle drei Jahre betreten die kleinsten Partikel die große Bühne: Bis zum 21. April ludt die PARTEC 2016 zum internationalen Kongress für Partikeltechnologie ins Kongresszentrum der NürnbergMesse. Mit dem aktuellen Forum erfolgreich in vollem Gange haben die Veranstalter Stefan Heinrich, Leiter des Instituts für Feststoffverfahrenstechnik und Partikeltechnologie der Technischen Universität Hamburg (TUHH), zum Chairman für die folgende PARTEC 2019 ernannt. Prof. Dr.-Ing. habil. Stefan Heinrich studierte Verfahrenstechnik/Thermischer Maschinenbau an der Otto-von-Guericke-Universität Magdeburg. Seit 2008 ist er Professor und Leiter des Instituts für Feststoffverfahrenstechnik und Partikeltechnologie der TUHH. Heinrich ist unter anderem Vorsitzender der ProcessNet-Fachgruppe „Agglomerations- und Schüttguttechnik“ sowie deutscher akademischer Delegierter in der Arbeitsgruppe „Mechanics of Particulate Solids“ der Europäischen Föderation für Chemie-Ingenieur-Wesen (EFCE). Parallel zu dieser hochkarätigen Wissensplattform PARTEC öffnete auf dem angrenzenden Messegelände auch die POWTECH ihre Türen. Unter den 900 Ausstellern der Leitmesse für mechanische Verfahrenstechnik war auch die TUHH mit einem Stand des Instituts für Feststoffverfahrenstechnik und Partikeltechnologie vertreten, der seit Messebeginn auf großes Interesse gestoßen ist. PARTEC versteht sich als internationales Forum für die Forschung und Entwicklung in der Partikeltechnologie. Alle drei Jahre bringt der englischsprachige Kongress Wissenschaftler und Ingenieure aus der ganzen Welt zusammen. Diskutiert werden Prozesse der Partikelbildung, Messmethoden, Prozesse wie Agglomeration und Beschichtung sowie diverse industrielle Anwendungen für Partikel. Die POWTECH ist weltweit die Nummer eins für Pulver-, Granulat- und Schüttguttechnologien. Die Messe spiegelt den aktuellen Stand der mechanischen Verfahrenstechnik und Analytik wider. Von der Pharma-, Chemie- und Nahrungsmittelbranche bis zur Glas-, Baustoff- und Papierindustrie suchen neben Projektingenieure und Produktionsleiter auch Schüttgutsachverständige nach Innovationen zum Zerkleinern, Sieben, Mischen, Fördern, Dosieren oder Granulieren. Sand, Waschmittel, Tabletten: Pulver sind überall. Mehr als die Hälfte aller Produkte in der chemischen oder pharmazeutischen Industrie werden aus Feststoffpulvern hergestellt. Das erfordert komplizierte Prozesse, die beschrieben und optimieren werden wollen. Dabei spielt die Modellierung eine große Rolle, das Forschungsgebiet von Dr.-Ing. Maksym Dosta. Der 32-Jährige ist seit dem 1. Februar 2016 neuer Juniorprofessur für Mehrskalensimulation von Feststoffsystemen am Institut für Feststoffverfahrenstechnik und Partikeltechnologie der Technischen Universität Hamburg (TUHH). Die Juniorprofessur am Exzellenzkolleg der TUHH wurde in Kooperation mit der Firma Glatt Ingenieurtechnik GmbH eingerichtet. Sie ist eine der größten Hersteller von Wirbelschichtanlagen zur Behandlung von Partikeln aus den Bereichen Pharma-, Lebens- und Futtermittel sowie Feinchemie. Die Herausforderung, die sich den Forschern bei der Prozesssimulation stellt: Sie können zwar die Dynamiken beschreiben, die sich zwischen zwei einzelnen Körnern auf der Mikroskala abspielen. Doch von diesen Körnern und Reaktionen gibt es mitunter Billionen, eine Modellierung des ganzheitlichen Prozesses unter Berücksichtigung jedes einzelnen Partikels ist unmöglich. „Man braucht also eine Art Übergang von der Mikromechanik zur makroskopischen Ebene“, beschreibt Maksym Dosta. Bei Mehrskalensimulationen von Feststoffsystemen handelt sich um eben diese Verbindung. Dr.-Ing. Maksym Dosta kommt ursprünglich aus der Programmierung. Der gebürtige Ukrainer studierte Rechentechnik an der Technischen Universität in Donezk, bevor er 2006 ans Max-Planck-Institut für Dynamik komplexer technischer Systeme in Magdeburg ging. 2008 wechselte Dosta an die TUHH, um im Bereich der Feststoffverfahrenstechnik promovierte. Wie es nun zu dem Umschwung kam? „Die Modellierung von Feststoffprozessen ist sehr kompliziert, man muss viel mehr Parameter berücksichtigen, als zum Beispiel bei Fluidprozessen. Das hat meinen Ehrgeiz geweckt“, sagt der frisch berufene Juniorprofessor. Dosta freut sich auf die fachübergreifende Zusammenarbeit mit Kolleginnen und Kollegen der TUHH und will am Exzellenzkolleg eine Forschungsgruppe zu seinem Thema aufbauen. Die Juniorprofessur ist im Rahmen des Exzellenzkollegs angesiedelt. Das in 2014 gegründete Exzellenzkolleg weist ein neues Forschungs- und Finanzierungskonzept auf. In Kooperation mit der Wirtschaft werden sechs neue Juniorprofessuren eingerichtet. Ziel ist es, gemeinsam nachhaltige Innovationen zu schaffen, die Wissenschaft und Wirtschaft in Hamburg gleichermaßen wettbewerbsfähig halten. in Houston, Texas, during 11th and 13th of April. Within an invited talk, Prof. Heinrich will talk about the recent advances in the field of particle technology. 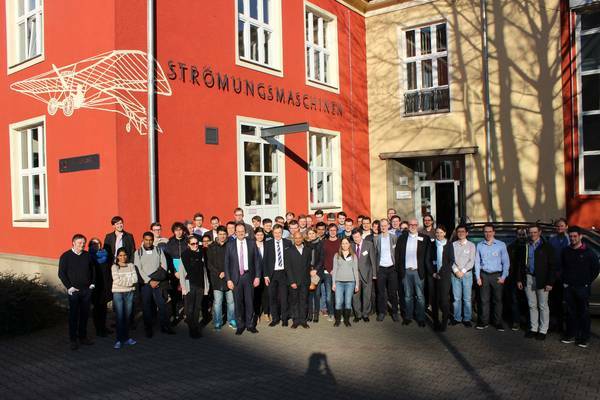 Students from the course Fluidization Technology within the Process Engineering visited together with Researchers from the Institute of Solids Process Engineering the fluidized bed and mixing operations of the company "SternMaid" in Wittenburg/Germany. Accompanied by Prof. Heinrich and shown around by Mr. Vernau from SternMaid, the students experienced the application of large scale fluidized bed in the food industry. 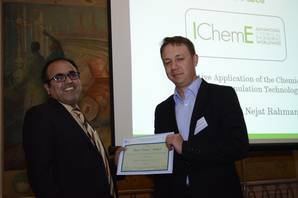 Der DECHEMA-Preis 2015 geht an Professor Dr.-Ing. Stefan Heinrich von der Technischen Universität Hamburg (TUHH). Der DECHEMA-Preis ist mit 20.000 Euro dotiert und wird jährlich von der Gesellschaft für Chemische Technik und Biotechnologie e.V. (DECHEMA) für herausragende Forschungsarbeiten, die die Technische Chemie, die Verfahrenstechnik, die Biotechnologie und das Chemische Apparatewesen betreffen, verliehen. Heinrich wird für seine wegweisenden experimentellen und theoretischen Arbeiten zur Formulierung von Partikeln durch Wirbelschichtgranulation ausgezeichnet. Mit diesen Methoden können Partikel mit bestimmten Eigenschaften gezielt hergestellt werden, die in so unterschiedlichen Branchen wie der Pharma- und Lebensmittelindustrie, in der Biotechnologie, Keramik und bei Batteriematerialien zum Einsatz kommen. Die Prozesse, die sich in der Wirbelschicht abspielen, sind außerordentlich komplex: Partikel stoßen zusammen, es kommt zur Befeuchtung, Trocknung und Filmbildung, Partikel brechen. Um Partikel mit gezielter Zusammensetzung, Schichtaufbau, Größe und Geometrie herzustellen, ist ein sehr gutes Verständnis dieser Prozesse notwendig. Heinrich beschäftigt sich mit der Analyse ebenso wie mit der Simulation der Vorgänge in der Wirbelschicht und hat neue Verfahren entwickelt, die eine gezielte Vorhersage über die Zusammensetzung und den Aufbau von Partikeln erlauben. Stefan Heinrich, geboren 1971, studierte Verfahrenstechnik/Thermischer Maschinenbau an der Otto-von-Guericke-Universität Magdeburg. Nach seiner Habilitation übernahm er dort 2002 eine Juniorprofessur. Seit 2008 ist er Professor und Leiter des Instituts für Feststoffverfahrenstechnik und Partikeltechnologie der TUHH. Für seine Arbeiten erhielt er zahlreiche Auszeichnungen, darunter 2004 den VDI-Ehrenring, den Ingenieurpreis 2005 des Landes Sachsen-Anhalt für „Innovative Ingenieurleistungen zur Energieanwendung“, den „Otto – SWM Wirtschaftspreis 2005 für die Entwicklung des Softwareprodukts FBSim und den Forschungspreis des Landes Sachsen-Anhalt für Angewandte Forschung 2006. Der DECHEMA-Preis gilt als wichtigster Preis der Verfahrenstechnik in Deutschland und ist mit einer Goldmedaille und 20.000 Euro dotiert. Die Preisverleihung findet am 1. Juni 2016 in Frankfurt/Main im DECHEMA-Haus statt. Auf der Fachtagung „7th International Granulation Workshop“, in Sheffield, Großbritannien, sind zwei Doktoranden vom Institut für Feststoffverfahrenstechnik und Partikeltechnologie der Technischen Universität Hamburg (TUHH) mit dem Best Poster-Award ausgezeichnet worden. Von 120 Postern belegte M.Sc. 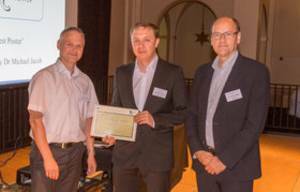 Eduard Eichner für seine Arbeit “Fabricating of hierarchically assembled ceramic-polymer composites using a spouted bed spray granulation process” den mit 300 Pfund dotierten ersten Platz und Dipl.-Ing. 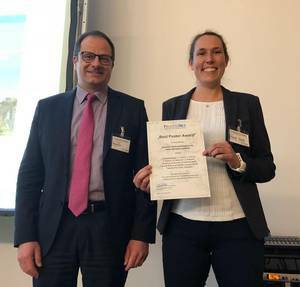 Anna Porowska für ihren Beitrag “Predicting the surface composition of a spray dried particle by modelling component reorganization in a drying drop” den als “Best Application to Industry” den mit 100 Pfund versehenen dritten Platz. Der Beitrag von Eduard Eichner entstand im Rahmen einer Kooperation mit dem TUHH-Institut für Keramische Hochleistungswerkstoffe, unter der Leitung von Professor Gerold Schneider, innerhalb des SFB 986 “Maßgeschneiderte Keramische Hochleistungswerkstoffe”. Sie widmet sich der Möglichkeit, mittels eines neuartigen Beschichtungsverfahrens in einer Strahlschicht hierarchisch strukturierte Keramik-Polymer-Kompositpartikel bzw. Bauteile herzustellen, die aufgrund ihrer speziellen Struktur eine besondere Festigkeit und Bruchzähigkeit besitzen. Diese speziellen Eigenschaften machen sie für technische Anwendungen interessant. Anna Porowska hat in einem gemeinsamen Forschungsprojekt mit der Firma Nestlé den komplexen Entstehungs- und Transportprozess der Proteinverkapselung von Partikeln während der Sprühtrocknung analysiert und mit mathematischen Methoden und neuartigen Experimenten zugänglich gemacht. Ihre Ergebnisse werden bereits von Nestlé angewendet und helfen, die Auslegung derartiger Multikomponenten-Prozesse sicherer und besser vorhersagbar zu gestalten. Der alle 2 Jahre stattfindende “International Granulation Workshop” ist die größte Fachtagung auf dem Gebiet der Granulation, Agglomeration, Beschichtung und Verkapselung von Partikeln und Feststoffen im Bereich der pharmazeutischen, chemischen, keramischen, biotechnologischen und Lebensmittelindustrie. The observations allow the food industry to develop concrete approaches for reducing fat bloom. “One consequence might, for example, be to reduce the porosity of the chocolate during manufacture, so that the fat migrates more slowly,” explains Reinke. “Another approach is to limit the amount of fat that is present in a liquid form by storing the product in cool, but not too cold, conditions. 18 degrees Celsius is ideal.” Chocolate is very sensitive to fluctuations in temperature. “Just a few degrees make a big difference,” Reinke notes. “At 5 degrees, basically, all cocoa butter is solid; and above about 36 degrees everything is liquid.” On top of this, the type of crystals in the chocolate plays an important role. “Cocoa butter crystallises in six different crystal forms,” explains Reinke. “The amount of fluid also depends on the form of the crystals.” Manufacturers can also limit fat bloom by controlling crystallisation. At our institute she was able to gather expertise in the field of CFD/DEM simulations for her research on Pyrolysis of Kraft Lignin. 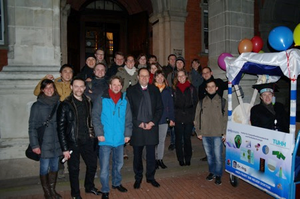 Besides that she was attending our celebration of the graduation of our PHD student Stefan Schnegas. Prof. Dr.-Ing. habil. Stefan Heinrich, Leiter des Instituts für Feststoffverfahrenstechnik und Partikeltechnologie der TUHH, wurde von der Johannes Möller Stiftung für Wissenschaft und Forschung zum 01.01.2015 für zunächst vier Jahre in das Kuratorium der Stiftung berufen. Die Aufgabe der 1999 gegründeten Möller Stifung besteht in der Förderung von Wissenschaft und Forschung, insbesondere auf dem Gebiet der Ingenieurwissenschaften (http://www.moellerstiftung.de). Die Stiftung vergibt hierfür jährlich den Johannes-Möller-Preis in Höhe von € 5.000 für eine herausragende Dissertation auf dem Gebiet der Feststoffverfahrenstechnik. Die jährliche Verleihung findet in der Regel im Rahmen des Jahrestreffens der ProcessNet-Fachgruppe „Mehrphasenströmungen“ statt. Das Kuratorium schlägt einen Preisträger aus den eingegangenen Dissertationen vor und erwartet hierfür Hinweise von Universitätsprofessoren und Fachkollegen aus der Industrie auf herausragende Arbeiten. In der Vergangenheit wurden auch drei Promotionen der TUHH mit dem Möller Preis gewürdigt: Herr Dr. Fries, ehemaliger Mitarbeiter von Prof. Heinrich und Herr Dr. Klutz sowie Herr Dr. Bruhns, ehemalige Doktoranden von Prof. Werther.